Again, I am thankful to the wider community for being complimentary on this project, and perhaps the reason why this release has been expedited. As always, would appreciate your continual support, and please feel free to write me back on beenudel1986@gmail.com if you've any feedback or anything related to security. Manual – On this, the tool will ask end-user for each API, if it needs to be hooked. Smart – This is essentially a subset of automatic hooking however, excludes uninteresting APIs. Identify the running process executable path. 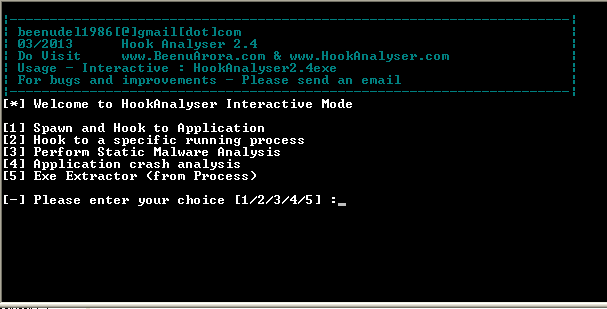 Signature trace (extended from malware analyser project), such as Anti VM aware, debug aware, keyboard hook aware etc. This particular function searches for more than 20 unique malware behaviours (using 100’s of signature). Online search of MD5 (of executable) on Threat Expert. 4. Application crash analysis - This module enables exploit researcher and/or application developer to analyse memory content when an application crashes.This module essentially displays data in different memory register (such as EIP).